David Ross is a former MLB catcher with the Atlanta Braves. He is the current catcher for the 2013 World Series champion Boston Red Sox. He is known for talking to kids about the importance of honoring their parents & building a relationship with Jesus. Call Christian Speakers 360 at 1.800.966.1380 if you would like to contact a David Ross booking agent for a speaking engagement, personal appearance, church function or other faith-based event. Christian Speakers 360 is a Christian talent agency for booking athletes, celebrities, ministers and entertainment. David Ross speaks about Christian values. Many of our speakers are born again Christian evangelicals who honor Jesus Christ's message through communities, schools and ministries. For information on David Ross's appearance fees, speaking costs and availability, contact David Ross's booking agent for details. David Ross is an MLB catcher with the Boston Red Sox. Ross played college baseball for Auburn University and the University of Florida, and participated in two College World Series. He was drafted by the Los Angeles Dodgers, and has played for six different Major League teams. On December 5, 2008, the Atlanta Braves signed Ross to a two-year, $3 million deal. For four seasons Ross was the Atlanta Braves secondary catcher behind Brian McCann. His hot start in the 2011 season (batting .333 after starting 7 games, with 3 home runs) highlighted his strengths, as Ross has always been known as a strong defensive catcher. On August 22, 2008, Ross signed a minor-league contract with the Boston Red Sox and came up to the major league club on August 29. Later on in the season he became a free agent. On November 10, 2012, Ross signed a two-year, $6.2 million deal to return to the Red Sox as "more than a backup but not a starter" behind primary catcher Jarrod Saltalamacchia. Ross twice suffered concussions and spent over two months on the disabled list during the regular season. However, he returned to health in time to play a key role in Boston's run to the championship, starting 4 games during the 2013 World Series and driving in the game-winning run with an RBI double in Game 5. To book David Ross for a speaking event or appearance, contact Christian Speakers 360. Watch David Ross speaking about his game winning hit in Game 5 of 2013 World Series. DISCLAIMER: Christian Speakers 360 does not claim to represent itself as the exclusive agent for David Ross. 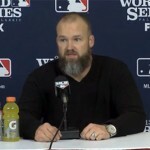 Christian Speakers 360 is a booking agency that represents organizations seeking to hire Christian athletes and celebrities such as David Ross for speaking engagements, personal appearances, product endorsements and corporate entertainment. Fees on this website are estimates and are intended only as a guideline. Exact fees are determined by a number of factors, including the location of event, the talent’s schedule, requested duties and supply and demand. Christian Speakers 360 makes no guarantees to the accuracy of information found on this website and does not warrant that any information or representations contained on this website will be accurate or free from errors. We are often asked how can I find out who is David Ross's agent? To find David Ross appearance fees and booking agent details, you can contact David Ross's agent, representative or manager through Christian Speakers 360 for speaking fee costs and availability. Christian Speakers 360 can help your company choose the ideal Christian speaker or entertainer for your next event. To hire David Ross for an appearance, speaking event or endorsement, contact David Ross's booking agent or rep for more information.